OtoCube (TM) is a registered trademark (No.011937778) of Netherlands-based OTOCUBE , a well-known and highly respected manufacturer and supplier of sound and vibration instruments, and noise control equipment. The field of sound and vibration is an ever-growing and ever-changing one. OTOCUBE anticipates market changes to keep pace with the continuous development of new and innovative products, each designed to address vibration measurements and noise control. A leader in sound and vibration technology, OTOCUBE invests heavily in product research and development. OTOCUBE’s team of acoustical, M.Sc and Ph.D. credentialed engineers is focused on improving and expanding its product line to continuously meet customer needs. The company’s latest product, the portable OtoCube, enables audiologists to perform precision testing and measurements on cochlear implants using a compact, calibrated box. The CI sound processor and microphone are placed in a small acoustical chamber within the unit’s calibrated box and connected to the patient via an extension cable to the cochlear implant’s transmitter system. 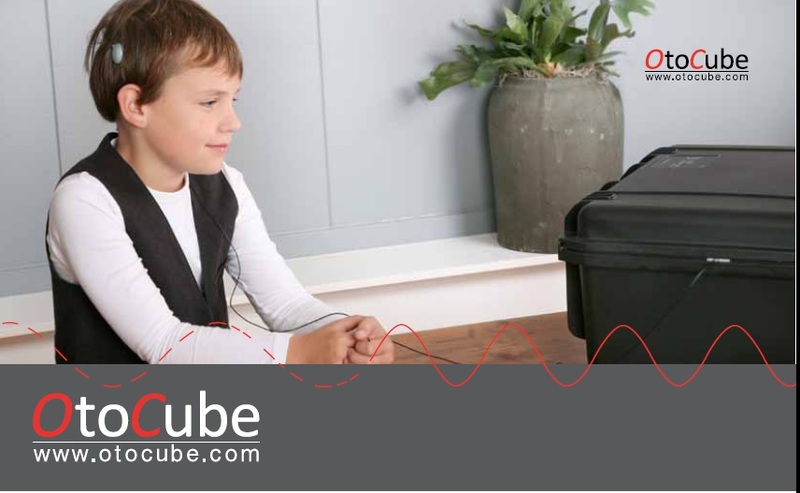 Once the test stimuli is presented to the CI processor in the acoustically insulated OtoCube, CI-patients can be tested on their perception of “speech in noise” under optimal testing conditions with excellent precision. The OtoCube has been tested by prestigious clinics in Belgium, Germany and Spain. With special software, the OtoCube can also be used as a fitting assistant to help the audiologist program cochlear implants. The OtoCube is a unique instrument designed specifically to deliver precise programming and fit with each cochlear implant. Using the OtoCube guarantees you’ll achieve the maximum benefits your cochlear implant has to offer. There are hundreds—possibly thousands—of possible program combinations available when it comes to fitting a cochlear implants to individual patients. Within the limited time the audiologists have to program a single patient’s CI, finding the best combination of settings to achieve optimum listening quality for each patient can be impossible, especially since results of each fitting can vary from one clinical setting to another. The OtoCube, however, can improve the performance of any CI, allowing patients to hear significantly more clearly with their existing device! The first and only tool to use computer technology (Neural/Symbian network) OtoCube provides a calibrated sound shielded box in combination with a class-1 measuring tool to accurately estimate the outcome of the CI programming. OtoCube’s intuitive software calibrates the box before measurements, remembers the results of the patient’s past fitting and compares the outcome result with other patient results. OtoCube takes advantage of the expert knowledge built into its software to achieve new heights in cochlear fitting! Results in every clinic can be compared and given the same (maximum) hearing outcome. If you want the maximum out of your cochlear implant audiologist expert ask you about the OtoCube.